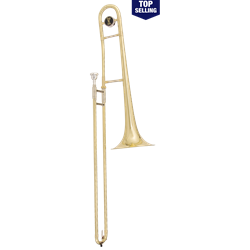 The Bach TB301 Trombone is made in the USA using nothing but the highest quality materials. It offers a .500" bore with a responsive 8" seamless bell for easy projection and control. The chrome plated nickel silver inner handslide tubes provide the ideal surface for smooth and quick handslide action. The clear lacquer finish provides a subtle warmth to the overall sound. The TB301 is a well designed durable instrument perfect for the beginning student and is well suited for all types of music. TECH SPECS .500" bore 8" bell Yellow brass outer handslide tubes Brass outer slide Chrome plated nickel silver inside slide Connecting ring on bell Clear lacquer finish Bach 12C mouthpiece 50883E molded case FREE SHIPPING with your purchase today!